If you are looking for a knock-your-socks-off appetizer, look no further than French Nachos. My friend Vicki first made these nachos for our Annual Christmas Ornament Exchange and I loved them so much. I knew that I definitely needed to make them again for a wine tasting that I helped to co-host. Preheat oven to 350℉. Combine the blue cheese, cream cheese, and whipping cream in a bowl. Mix well and set aside. Place the chips in a single layer on an oven-proof platter. 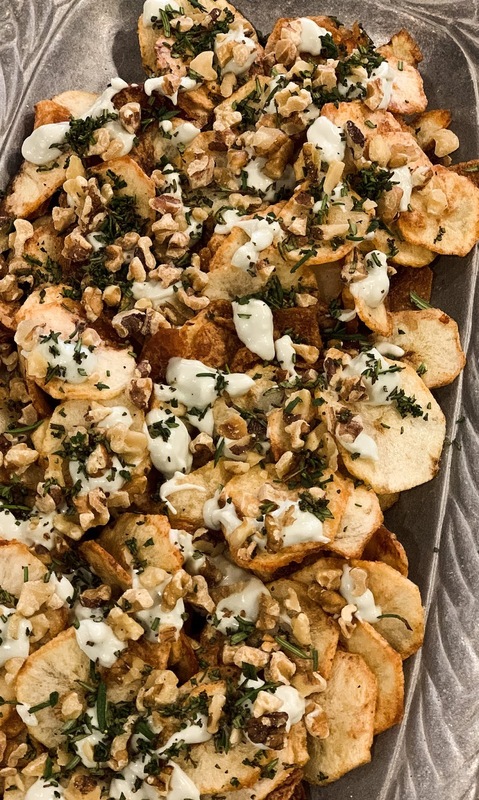 Drizzle the chips with the cheese mixture, herbs, and walnuts. Heat in the oven for about 8-10 minutes until the sauce is completely warmed. Remove from the oven and drizzle with the balsamic glaze. These nachos are so easy to make and everyone loves them. 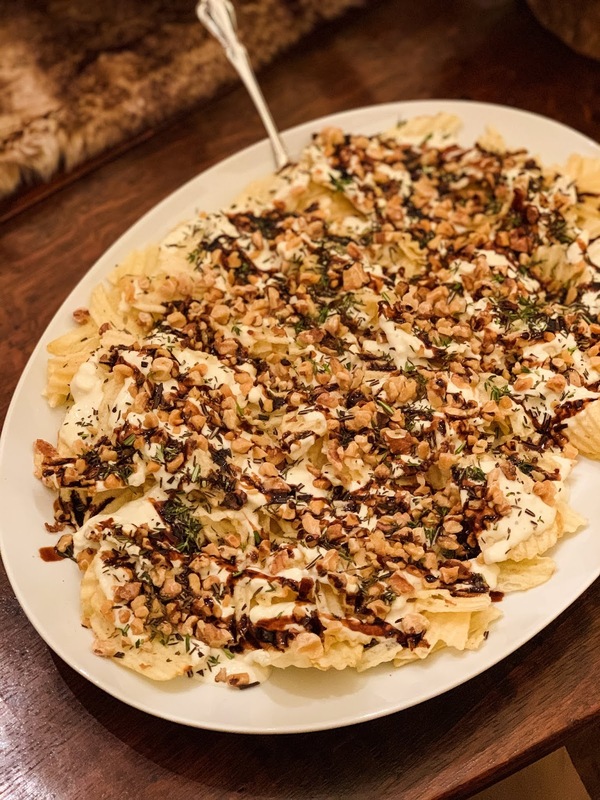 I have to confess that I’m not even a huge blue cheese fan, but the sauce, herbs, walnuts, and balsamic sauce totally work. They are absolutely delicious. 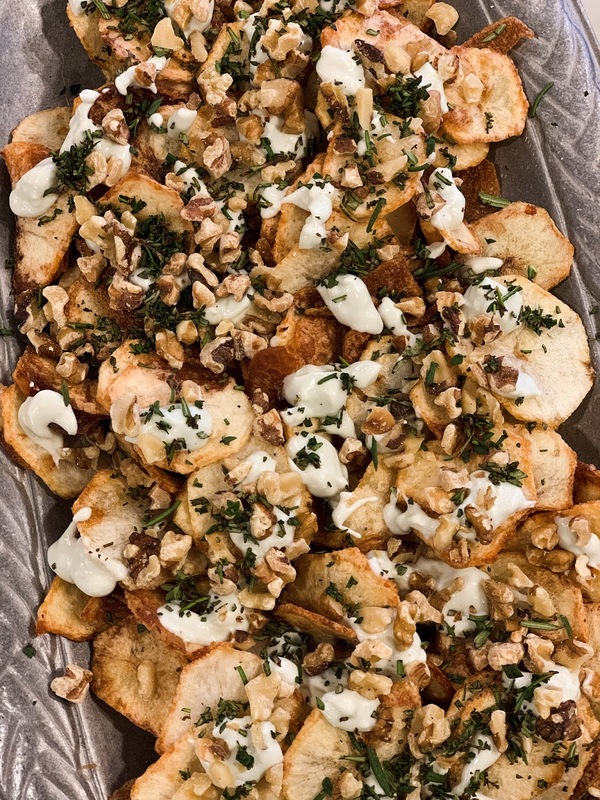 Because I’m extra… I decided to take the chips up a notch and make my own homemade potato chips, but these are also awesome with bagged potato chips.